Here's another great story about a ski area we had little info on, which turned into one we have a lot on! Turns out that the family that owned this mountain found NELSAP and have shared their memories and pictures for all of us. John and Sandy Sasur are the children of the owners/developers of this ski area. 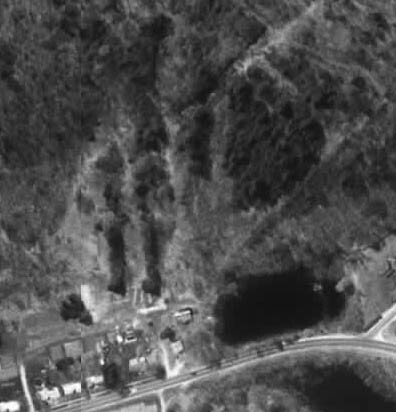 In fact, Sandy is looking for anybody else who may have stories, photos, or memories of this ski area. If you skied here and would like to talk to her, her email address is SandyGardenGirl@aol.com. The grandson of the founders, Michael Pyzocha, has created a website on Hemlock Hill, which can be accessed here. A great way to preserve their family ski area! 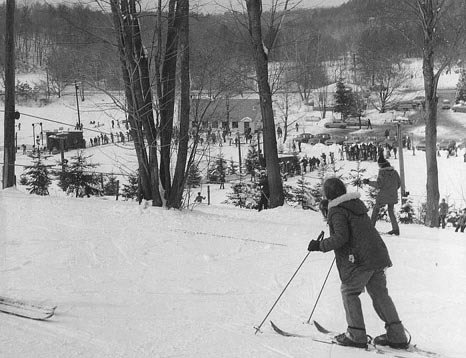 A young skier overloooks the rope tows at Hemlock Hill. Picture courtesy of John Sasur. 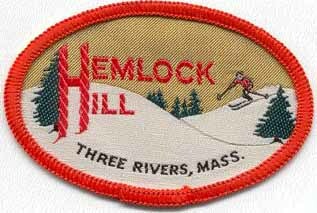 I was basically born and brought up operating a small area run by my parents (Hemlock Hill in Three Rivers, MA). I remember we did not have snowmaking but every day my father would haul snow up with the snowcat from parking lots, fields, ponds or whatever and dump it on the slopes. In the summer he would cut and bulldoze new slopes and repair lifts. The ski business was tough work all year long. I spent many long, cold nites watching the tows by a hot barrel stove or picking rocks and cutting brush during the summers. Met my wife 25 years ago on the slopes...and so did a lot of other couples. Some weekends, there would be over 500 people skiing, skating or sledding on the hill. We had 4 rope tows. One of the rope tows was a "long" and "steep" lift of 1100'in length and 250' vertical. Another lift took you to the peak which was another 900' and 150' of vertical. Anyone who could ski this area could ski anywhere in the east. Boy, did we turn heads when a bunch of us "locals" hit the "big" slopes of VT. All the lower slopes were lite for nite skiing and for skating. The lodge had two big fireplaces. It cost $1.50 for a kid to ski all evening. When we had good snowfall, the area was open for 75 days with natural snow...impossible nowadays. 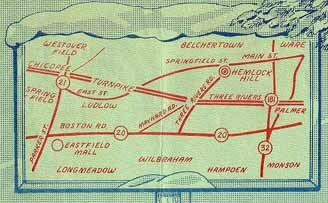 The trail map of Hemlock Hill during one of its first years in operation. Notice the series of rope tows, open slopes, and trails. Compare this to the Terraserver pic below. Again, some great memories were brought back when I toured your many abandoned ski slopes. My parents used to visit as many other areas as possible to get ideas. We met a lot of the other owners - all great people and none made a dime on their business venture. 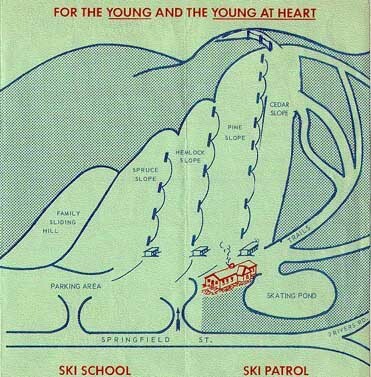 There was even a MA Ski Areas Assoc. I am the youngest of we four children who helped our mom and dad totally create a ski area right in our own backyard. I was lucky at being just 5 years old, and my first skis were the only ones out of all of ours that on that first skiing Christmas, mine could be turned around indoors in our hallway!!! Boy the stories my two sisters and my brother could tell you!!! The cover of one of the first brochures, from John Sasur. Here's how to find Hemlock Hill. 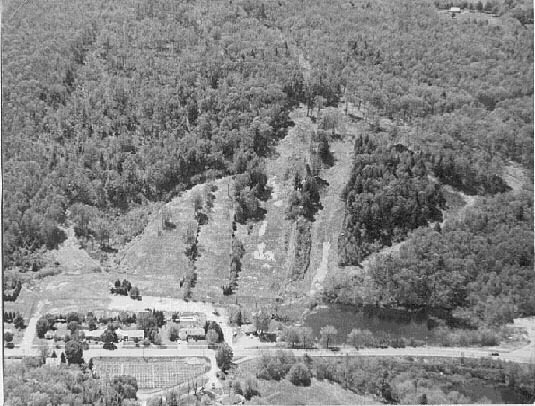 Dave Ouellette: Hemlock Hill in Three Rivers, Ma was open in the late 1960's into the early 1970's and had 3 rope tows and night skiing. the area had a skating pond next to a small lodge and actually got very busy on Friday nights with a lot of kids. Steve Bongiorno: I know a guy that worked and skied here. There was a IMP snowcat sitting in the garage. It was surrounded by trees but in mint shape. I understand somebody swiped it a few years back. An overhead view of the ski area during the springtime of one of its years in operation. This shows the decent variety of skiing offered here. Compare it to the photo below which shows the area on Terraserver, growing in. Image courtesy www.hemlock-hill.com. Here is the Terraserver overhead shot of the ski areas. Notice the extensive development of trails, far more than you would normally expect. Area found by Betsy McDonough.